Because Japanese capsule toys are well made and many of them are collectable, not only kids but also adults love capsule toys in Japan! 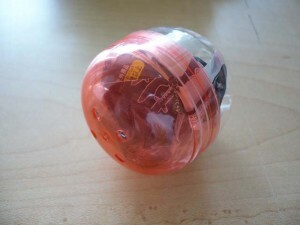 Capsule toys are usually 100 or 200 yen for one crank. There are unique toys include character items, nylon bag, keychain, miniatures fine art piece, classical art pieces, sound toys, lay figures, prank toys. Capsule toys machines are found in game arcades, game shops, supermarkets, video rental shops, and tourist attractions. 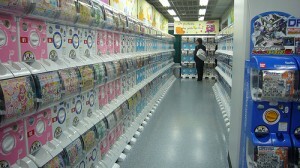 Sometimes there are bunch of capsule toys machines at one place, or even “capsule toys stores” where there are hundreds of capsule toys machines.